at an historic event co-sponsored by the Simon Wiesenthal Center in Los Angeles. The document, the first of its kind to be written by an Arab Head of State, calls for people of all faiths to show respect for, and protection of, the rights of everyone to practice their religious affiliations in dignity and peace. HH Prince Nasser bin Hamad al Khalifa,representing his father, HRH King Hamad, signed the Declaration along with Rabbi Marvin Hier, Founder and Dean of the Simon Wiesenthal Center. 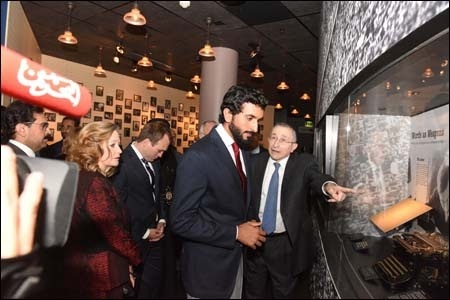 A 40-person delegation from Bahrain accompanied Prince Nasser to Los Angeles and joined with him for his visit to the Museum of Tolerance. 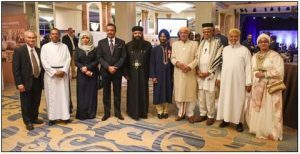 Arab diplomats from across the Middle East, along with representatives of 15 nations from 5 continents and 300 Interfaith leaders from around the world represented Christians, Muslims, Jews, Hindus, Buddhists and Baha’i communities, at the historic gathering. 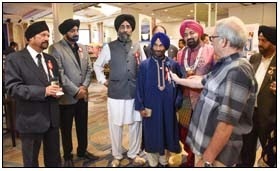 Also participating in the event were Rev. Johnnie Moore, recipient of the Wiesenthal Center’s Medal of Valor for his work with Christian refugees, Mohammed Khan, Director of Interfaith Outreach, King Fahd Mosque as well as Dr. Judea Pearl, father of journalist Daniel Pearl who was beheaded by terrorists and a Saudi mother whose son was killed by an ISIS suicide terrorist at a mosque. Mary Hart, former Entertainment Tonight host and Simon Wiesenthal Center Trustee emceed the evening. 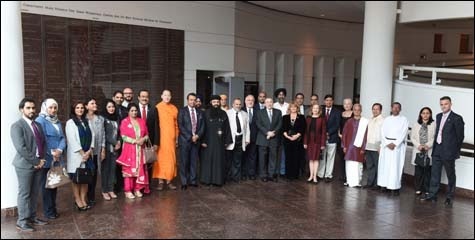 Religious leaders from Bahrain toured the Museum of Tolerance. 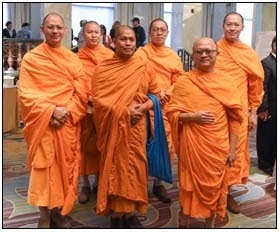 This entry was posted in News & Views. Bookmark the permalink.